This is Touch Surgery, a new iPhone and iPad app designed to help trainee surgeons learn the steps of their operations. Described as a “mobile surgical simulator”, it is not to be confused with the fun-for-all-the-family game Operation. 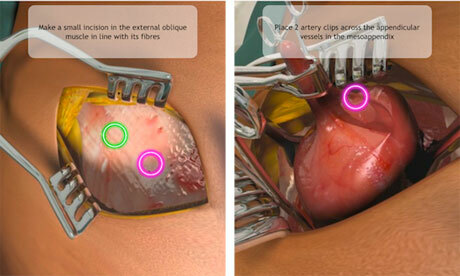 … Touch Surgery takes it to a whole new level: every step of each procedure is animated in graphic 3D detail. It’s not for the squeamish. The modules have been developed on the basis of cognitive task analysis, breaking down each operation into a series of steps and decision points, and using learning by interaction to make the process stick. A test function also allows you to assess your ability and track your progress as you work through the procedures. As well as developing further modules, the team is looking to build an online interactive network, allowing surgeons to exchange tips and tricks on certain procedures.